Organic Ginger Essential Oil (Zingiber Officinalis) - Sweetgrass&Rain Inc.
Ginger is a perennial herb that grows to about 3 - 4 feet high (approximately 1 meter). It has a characteristic thick spreading tuberous rhizome. The ginger root is macerated and distilled to extract the oil. 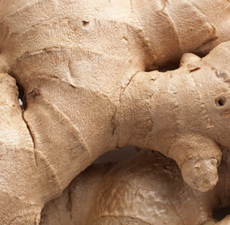 Ginger Essential Oil has a warm, spicy, woody scent with a hint of lemon and pepper.